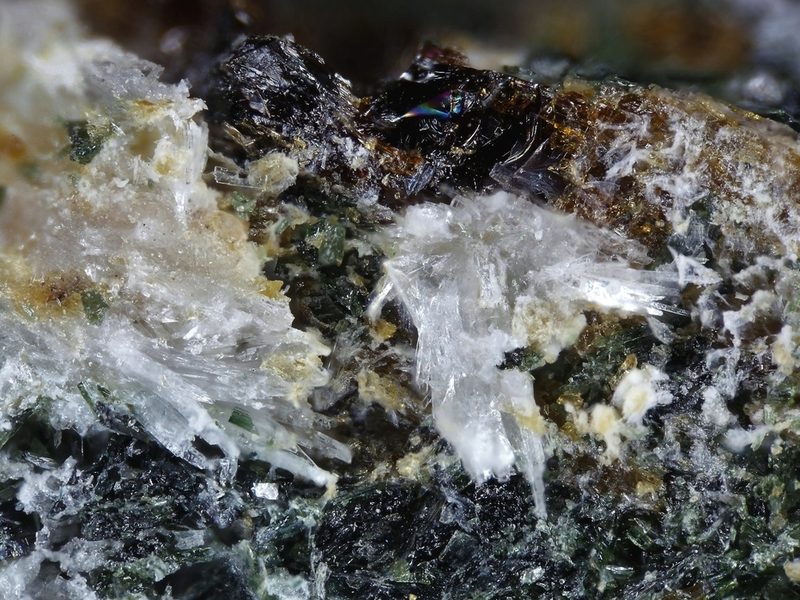 Cryptophyllite: Mineral information, data and localities. Closely related to shlykovite and mountainite. Shlykovite 1 photo of Cryptophyllite associated with Shlykovite on mindat.org. Natalia V. Zubkova, Yaroslav E. Filinchuk, Igor V. Pekov, Dmitry Yu. Pushcharovsky, Elena R. Gobechiya (2010): Crystal structures of shlykovite and cryptophyllite. Comparative crystal chemistry of phyllosilicate minerals of the mountainite family. European Journal of Mineralogy 22, 547-555. Pekov I.V., Zubkova N.V., Filinchuk Ya.E., Chukanov N.V., Zadov A.E., Pushcharovsky D.Yu., Gobechiya E.R. Shlykovite, KCa[Si4O9(OH)]·3H2O, and cryptophyllite, K2Ca[Si4O10]·5H2O, two new mineral species from the Khibiny alkaline complex, Kola Peninsula, Russia,Zapiski RMO, 139(1),37(2010); Pekov I.V., Zubkova N.V., Filinchuk Ya.E., Chukanov N.V., Zadov A.E., Pushcharovsky D.Yu., Gobechiya E.R. (2010): Shlykovite, KCa[Si4O9(OH)]·3H2O, and cryptophyllite, K2Ca[Si4O10]·5H2O, two new mineral species from the Khibiny alkaline complex, Kola Peninsula, Russia. Zapiski RMO, 139(1), 37-50.